Laura Allen is a visual artist, writer, and instructor living in Seattle, Washington. She attended university at Stetson University in Florida (majoring in Biology and English Literature) and University of North Texas (majoring in Visual Art.) She currently works primarily in paint, collage, drawing, and mixed media. Laura is also an actively publishing writer, workshop instructor, and enthusiastic arts advocate. Her visual art has been featured in numerous exhibitions, and her poetry and other writing has appeared in numerous regional and national journals. She has worked in diverse literary positions as well, from adjunct creative writing instructor to editor-in-chief of a bimonthly arts magazine. 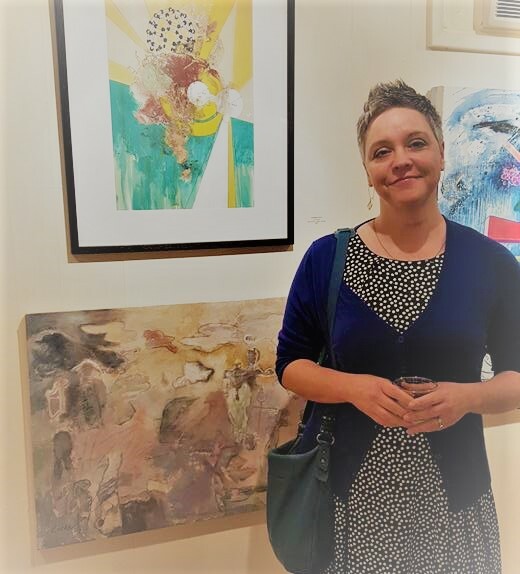 Recently, her visual art has appeared in juried exhibits at Ryan James gallery in Seattle, Schack Art Center in Everett, and Verum Ultimum gallery in Portland. Her last solo show was held by Virago Gallery of Seattle. Her poetry has also appeared numerous journals, including Pontoon, Tinderbox, and S/tick. She won the 2017 Auburn Arts Fest open mic competition reading from her recently published chapbook, "The Quiet Year." She is currently the host and producer of the arts podcast Original Lines, and the owner of Two Ponies Press.